Cooped was funny. Very, very funny. Spymonkey follow their smash hit Stiff with an even more ridiculous collection of characters and situations. 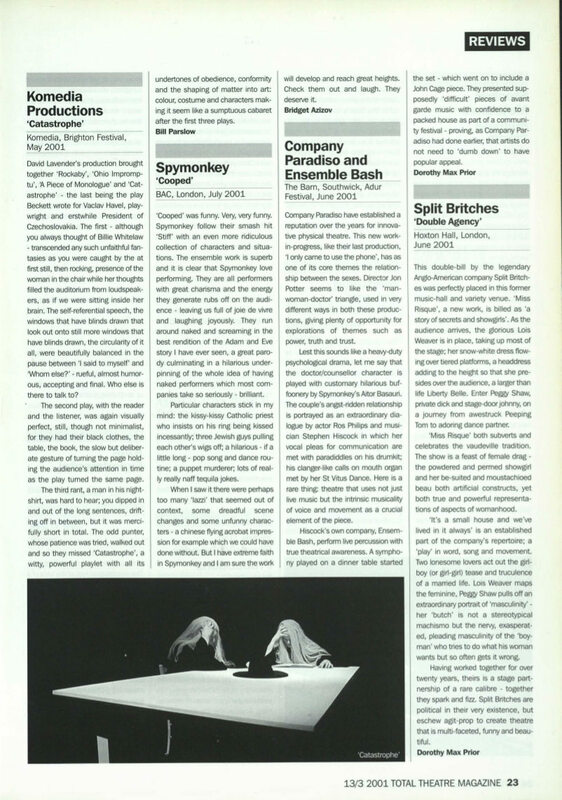 The ensemble work is superb and it is clear that Spymonkey love performing. They are all performers with great charisma and the energy they generate rubs off on the audience – leaving us full of joie de vivre and laughing joyously. They run around naked and screaming in the best rendition of the Adam and Eve story I have ever seen, a great parody culminating in a hilarious underpinning of the whole idea of having naked performers which most companies take so seriously – brilliant. Particular characters stick in my mind: the kissy-kissy Catholic priest who insists on his ring being kissed incessantly, three Jewish guys pulling each other’s wigs off; a hilarious – if a little long – pop song and dance routine; a puppet murderer; lots of really really naff tequila jokes. When I saw it there were perhaps too many ‘lazzi’ that seemed out of context, some dreadful scene changes and some unfunny characters – a Chinese flying acrobat impression for example which we could have done without. But I have extreme faith in Spymonkey and I am sure the work will develop and reach great heights. Check them out and laugh. They deserve it.